Back last season when rumours of a Western League Hop were mentioned, I was pretty pleased as I have not been to many in this league. I was pretty pleased as I'd not been to many grounds down this way. Initially it was rumoured to be the previous weekend, and with the situation at work meaning I needed to book my holiday well in advance, I chose my week off accordingly. 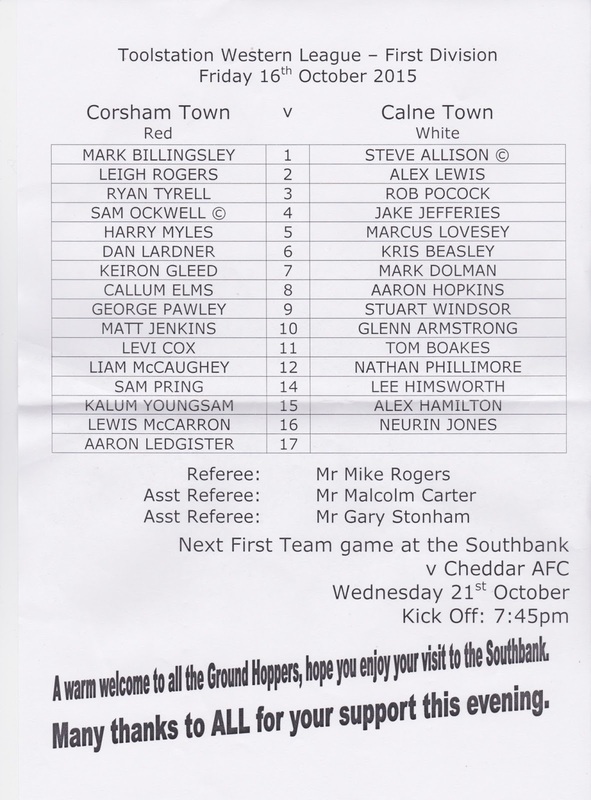 When it was announced as the following weekend, it wasn't too much of an issue as I'd already done one of the two grounds on the Sunday, albeit a real cracker of a ground at Melksham Town. 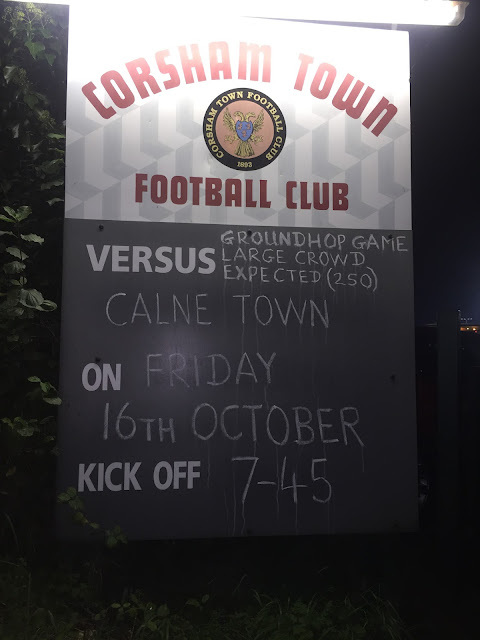 I'd actually been to Calne to see the reverse of this fixture last March, played on a Friday night as it was a bit of a local derby. CORSHAM TOWN were founded in 1884. They played in local leagues up until 1998 when they joined the Western League. Initially starting at Division 1 level. a 5th placed finish in 2004 was enough to see them promoted to the Premier Division and they took to the higher level exceptionally well, following up 2 runners up places with the championship in 2007. However, they were not promoted and the next few seasons saw a period of decline, resulting in their eventual relegation back to Division 1 in 2012. 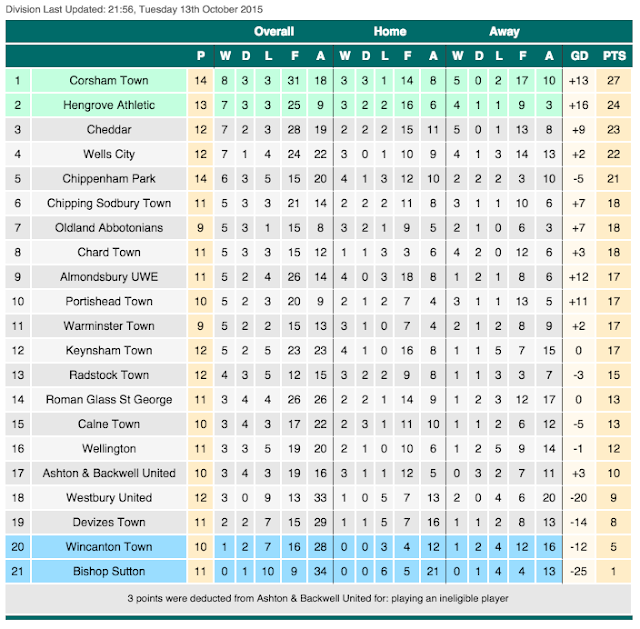 Despite a 4th placed finish in their first season back, mid table finishes have followed but prior to tonight's game, they sat top of the table, having enjoyed an excellent season. In the FA Cup they got as far as the 2nd Qualifying Round in 2007 but a 2-1 defeat to Bashley ended their aspirations. The season before they got to the FA Vase 3rd Round but lost to Bideford. 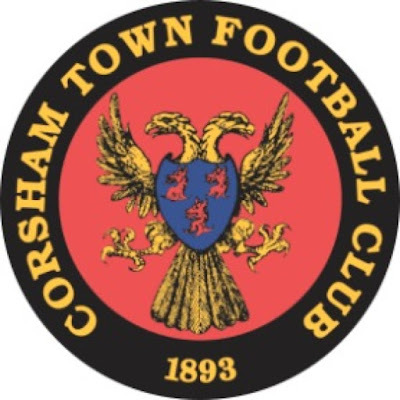 Several local cups have been won, including the Wiltshire Senior Cup on 5 occasions as well as the Wiltshire Junior Cup and the Western Football League Cup. On the day of the game I woke up around 9am, after a decent nights sleep. Pretty much the whole of the day was spent on catching up on my blogs with me completing the ones I had been visiting in the week and also doing the research for the upcoming Western League ones that would save me a bag of time when it came to doing my write ups later in the day. It meant I was pretty tired come my 4PM leaving time, but once I’d filled up my car at a local petrol station, I was on my way. I was pretty lucky at the petrol station, reversing into the only space available, otherwise it would have been a 15 minute wait with at least 2 cars waiting at each pump. As the M4 was knackered, I had to go cross country up until Reading and even then I got stuck in traffic with others very hesitant to get a move on. I stopped at ASDA in Melksham along the way as I needed a car charger for my phone. Typically the damn thing was as dead as a dodo but at least I can get a refund at my local store at my leisure. On the decent side at least I got some chicken and other snacks for my dinner, plus some local cider to take home with me. From there I left for the ground, getting there just after 7pm. I said hello to Laurence and picked up my programme pack for the weekend before walking around and talking to other hoppers. I had my chicken dinner and a couple of cans of cider before settling down to watch the game. 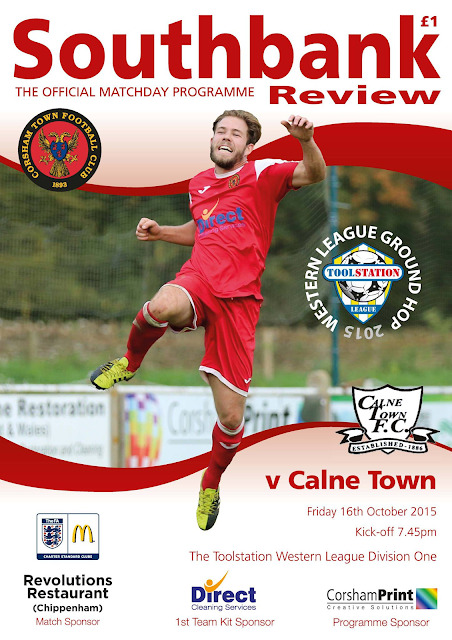 As for the game, visitors Calne might have started lower in the table but they were the better side. They opened the scoring on 15 minutes with a towering header. Stuart Windsor has the chance to double the lead 3 minutes later but he screwed his shot wide of the target. There were further chances for both sides but it stayed 1-0 to the visitors in what was a great half of football in front of 293 fans. The second half started in much the same fashion. Kris Beasley doubled the visitors lead on 55 minutes with a tidy low finish. The visitors continued to be the better side and although the hosts had chances to reduce the arrears, Calne had the chance extend the lead but had a chance cleared off the line. Eventually Corsham did get one back with around 5 minutes to go as the visitors defence was far too complacent and were caught napping. This lead to a bit of panic in their defence but they held on much to the delight of their team, who had claimed a significant scalp in this local derby. After the game I made a swift getaway and it was a good journey home, taking an hour and twenty minutes. I caught up on goings on online and completed my blog amongst other things. I got into bed around midnight, knowing that I had a long one the following day, with 4 games in one day. SOUTHBANK is a ground I visited back in 2007 on the way to a Wycombe game somewhere in the Westcountry. It's quite a basic ground with just the one area of cover - the Southbank Stand which holds 112 fans and is a metal 'arena' type stand. The rest of the ground is open hard standing and has a capacity of 1200. The bar is large and offers a wide range, as does the tea bar and all are at reasonable prices. Merchandise available includes badges and mugs.